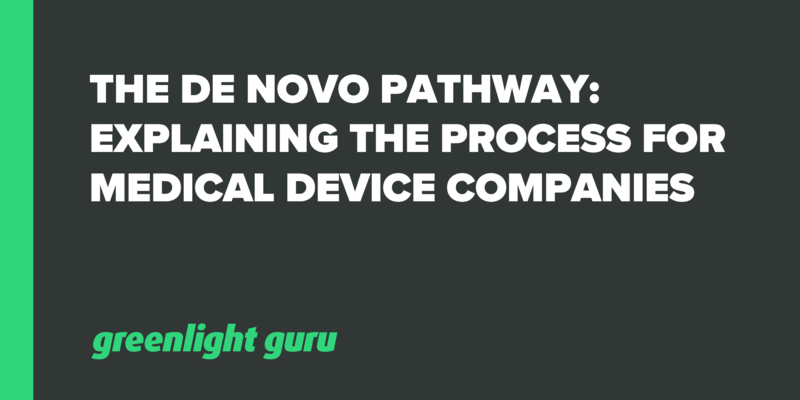 The De Novo pathway has been around for more than two decades, but it is still one of the least used pathways by medical device companies when bringing a product to market. This may only be the case for a short while longer, as we're starting to see the popularity of this pathway trending toward change. According to a RAPS report, records show that De Novo submissions are on the rise, with 2018 as its biggest year for number of devices granted. What's even more interesting is that this regulatory pathway is slated for some major changes sometime in 2019; CDRH announced the changes as "major policy clarifications." Still, many medical device companies remain unfamiliar with the current De Novo process. Could this be a leading indicator as to why most companies decide to take the 510(k) pathway to market instead? Both options are intended for Class I and Class II devices, but there are key distinctions that medical device companies need to understand about the De Novo process. Free Resource: Using the De Novo pathway for your submission? Click here to download these valuable tips. What is the De Novo Pathway? It may surprise a lot of folks that FDA's De Novo pathway has been around since 1997. There have been a few iterations made over the years, but in essence, the De Novo pathway is a classification process that uses a risk-based methodology for the approval of new and novel devices to be sold in the market. That’s a key difference between De Novo and it's counterpart, the 510(k) pathway. While 510(k) submissions rely on a predicate device that must prove substantial equivalence for market clearance, De Novo submissions begin with a clean slate and don't use any existing equivalence criteria as a basis for approval of a device. And for this reason specifically, some companies consider De Novo as part of their competitive regulatory strategy. So why hasn't De Novo become a more commonly used pathway? When it was initially developed, a primary goal was for it to reduce the burden on manufacturers bringing low to moderate risk medical devices to market. Previously, an entirely new product was to be considered as a Class III device, putting a potentially low-risk device in the same category as say, a new type of pacemaker. The problem being, in order to get market clearance through the initial iteration of the De Novo process, companies were still required to submit a 510(k) and have it declared as “not substantially equivalent.” This created more of a regulatory burden, along with longer than average processing times. Since around 2011, this has been remedied by FDA, removing the 510(k) stipulation from the approval criteria. Who qualifies for De Novo? Generally speaking, companies using the De Novo pathway do not qualify for 510(k) clearance, due to the fact there is not an existing predicate device substantially equivalent already on the market. In which case, the medical device is deemed “novel,” and if the novel device is classified as low to moderate risk, then the De Novo pathway may be open. FDA will review De Novo requests for devices that are not within a device type that has been classified under the criteria at section 513(a)(1) of the FD&C Act. This includes devices that do not fall within any existing classification regulation, where the De Novo requester either determines that there is no predicate device or has received an NSE determination on a 510(k) submission. 2. You should sufficiently understand and be able to explain all of the probable risks to health and probable benefits of the device, explain the measures needed to effectively mitigate all probable risks, and explain how device safety and effectiveness can be assured through the application of general controls or general and special controls. Between De Novo and 510(k), in many ways, the De Novo pathway is the simpler option. When companies undergo a 510(k) submission, they must prove both substantial equivalence and a solid risk mitigation strategy to FDA. When it comes to submitting a De Novo request, companies with NSE devices must be prepared to argue their robust risk mitigation strategy. You should sufficiently understand and be able to explain all of the probable risks to health and probable benefits of the device, explain the measures needed to effectively mitigate all probable risks, and explain how device safety and effectiveness can be assured through the application of general controls or general and special controls. In terms of safety and efficacy guidelines, the De Novo pathway is a little more demanding than 510(k). When you take the 510(k) route, it is assumed that, as there is a predicate device on the market, then the device has already been deemed safe and effective. With De Novo, there is no assumption in that regard and you’re working from scratch to prove all necessary safety and efficacy requirements. One important thing to note for De Novo submitters: although your novel device will not be SE to another existing device, it may behoove you to still include a predicate device in your risk mitigation strategy. For example, a similar functioning device on the market has packaging or labeling that is applicable to yours. Work smart - there is no need to reinvent the wheel if it will only delay your time to market. How do you decide if De Novo is the right pathway for your company? As I mentioned earlier in this piece, some device makers consider De Novo to be a competitive advantage. When a De Novo request is granted, FDA has made a decision, based on what was submitted by the company, on the risk classification as either a Class I or Class II medical device. Allowing FDA to decide the risk classification of your device is one option, but you can also make an argument to recommend one classification over the other. Why would a company do that? Well, consider the new level of difficulty for potential competitors who must now prove substantial equivalence to a higher-risk device...not to mention De Novo would be excluded from their available pathways to market. On the other hand, while lowering the regulatory bar might accelerate your time to market, it does the same for competitors. It all comes down to this being a business or strategic decision for your company. Another question to ask yourself is, how confident are you in your ability to demonstrate risk mitigation during the submission process to FDA? You must be able to demonstrate conclusively that your device should be classified as either Class I or Class II. One recent change to pay mind to is that De Novo requests now have fees attached - fairly substantial fees when you look at FDA’s fee schedule, although significant discounts may be available based on the size of the company. If you unable to get your De Novo request granted, your alternative options are going to cost you time and money. So make sure you are diligent throughout the process and the lines of communication are open with FDA throughout the review process. There are a couple of different options available for communicating with FDA and it’s generally worth your while making the effort to do so. Pre-submission. This is a useful way to obtain early feedback from the FDA. 2. 513(g). There are different forms of 513(g), but the one I’m referring to here is a “request for classification.” There is a fee associated with it (found at the fee link shared earlier), but essentially, you can argue for a Class II or III classification from the FDA. The same is not allowed with a pre-submission. The advantage of a 513(g) is that you can go into the De Novo submission with an agreed-upon classification. Ultimately, it’s entirely up to you which mechanism you choose - one is not better than the other and the decision should come down to which option is best for your specific device and company. The De Novo pathway can be a good alternative for companies unable to get 510(k) clearance, but able to prove NSE of their novel device and that it is of low to medium risk. Be sure to not neglect the available resources and tools to help you during this process. Medical device companies can benefit tremendously from utilizing the right quality system to manage this critical part of your pathway to market. The conventional approach to quality management systems in the medical device industry has always been through just a compliance lens, not quality. And that has made it very inefficient. Compliance is critical, but it’s possible to stay compliant and save time while also focusing on true quality of your products and processes. The submission process doesn't have to be a painstaking one as you bring your product to market. Greenlight Guru simplifies design and development activities for medical device companies with its industry-specific workflows built in throughout the quality management software, saving companies hundreds of hours per project. No more time spent on menial tasks, such as tracking down documents or updating spreadsheets – instead, device makers can spend this time on value-added parts of their job and get their products to market faster.